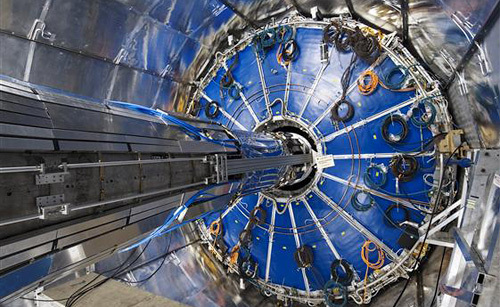 Cern's Large Hadron Collider Approaching A Brisk -456°F – Soon To Be One Of The Coldest Places In The Universe | OhGizmo! I Pity The Fool That Doesn’t Buy This A-Team R/C Car! According to the BBC, Cern’s Large Hadron Collider is in the final stages of being lowered to a temperature of 1.9 Kelvin, which is about -456°F or -271°C. In order for the collider’s thousands of magnets to maintain a high magnetic field with minimal power consumption they’re required to be superconducting, so liquid helium is currently being used to cool them down. Roberto Saban, the LHC’s head of hardware commissioning, said that in order to obtain high magnetic fields without consuming too much power, the magnets were required to be “superconducting”. This is the property, exhibited by some materials at very low temperatures, to channel electrical current with zero resistance and very little power loss. Helium exhibits spectacular properties at 2.2 Kelvin – becoming “superfluid”. This allows it to conduct heat very rapidly, making it an extremely efficient refrigerant. For comparison, while the LHC is being lowered to 1.9 Kelvin, the temperature in remote regions of outer space is a balmy 2.7 Kelvin, and my cold, cold heart comes in at around 3.2 Kelvin. That’s why I originally suggested that the Cern team should use years and years of sarcasm to bring the collider’s temperature down, but they felt the emotional toll on their staff would be too high. And if you want to keep track of how the LHC’s cool-down is coming along, you can check out their website from 1997 which features an updated graphic showing the temperature of various sections. We need more updates! IMPORTANT NOTICE: I am hosting a personal CERN LHC – Public Opinion Poll, at the direct web-link below. The poll results shall be sent to CERN top officials, and even Stephen Hawking (if his staff will forward to him). These individuals have already been notified of the polls ‘opening status’ and it’s ‘in progress’ nature. The poll closes October17, 2008, and the statistics will be forwarded, before any major full-power collisions. Everyone is welcome to observe, but must register to Vote; this is to prevent spam-bot malware from gaining access, but don’t let that stop you. We need the votes, for our voice to be heard, for the now, and future generations to come! Thanks for the support! Note: Go Ask Alice, I think she’ll know! Do you know what you get when you mix high energy colliders with Professor Otto Rossler?s charged micro black hole theory? Something even colder that that.